Warships assigned to the Combined Maritime Forces’ (CMF) Combined Task Force 150 (CTF150) have rendered medical assistance to regional mariners at sea. French warship FNS Montcalm and the United States of America’s USS William P. Lawrence were conducting engagement activities in the Gulf of Oman when medical aid was requested by two separate groups of vessels. During a routine approach and assist visit, the medical team from Montcalm was transferred to the visited fishing dhow to treat an Iranian crew member who had a broken leg. Montcalm’s embarked doctor was able to assess the patient and provide advice on how to best manage the individuals’ injury at sea as well as providing initial treatment. The following day, William P. Lawrence identified a dhow under tow and was requested to provide mechanical assistance. While on board assessing the engineering situation the boarding party noticed that several Iranian crewmembers aboard both vessels had a number of minor injuries and aliments. William P. Lawrence embarked her medical team and provided treatment to the crew, who were suffering with injuries including an infection from handling poisonous fish, an abdominal wound, eye infections and general cuts and abrasions. Hospital Corpsman Third Class Petty Officer Alyssa Hardin was able to provide immediate treatment as well as providing medication and advice to facilitate on going care for the injuries. Petty Officer Alyssa Hardin provides treatment for an injured crew member. The Commander of CTF150, Commodore Charles McHardie, said that the CMF regularly provides this type of assistance. “As mariners we all understand that life at sea can be inherently hazardous and our access to support services, such as medical treatment, that would be routine on land can be restricted,” Commodore McHardie said. “Our forces endeavour to improve the conditions for regional mariners however they can. Our primary focus is on improving the security environment but situations like this highlight that this is not the only role we have in this region. 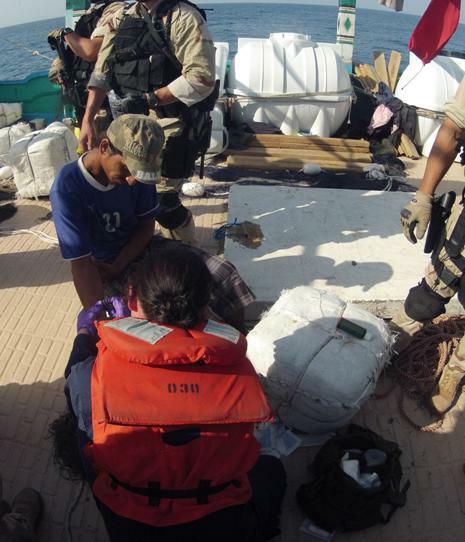 Montcalm and William P. Lawrence also provided the crew of the vessels with other general assistance including the distribution of sunscreen, protective work gloves and emergency contact information for the maritime security forces operating in the area. Commodore McHardie is the fourth Royal Australian Navy Officer to command CTF 150, one of three task forces commanded by CMF, a 27-nation international partnership.